Having just come from Koinonia Farm and gleaned from conversations there that, among some in the New Monasticism movement, there is a growing interest in connecting more deeply with the classic monastic tradition, I was eager to bring “old-school” monastics into the conversation. 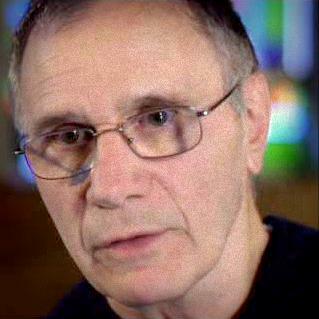 Here I speak with Cistercian monk Michael Lautieri, OCSO, current vocation director of Monastery of the Holy Spirit in Conyers, Georgia. In our conversation, I asked Michael how neo-monastic communities might better learn from monasteries and the monastic tradition. He offers two concrete possibilities—monastics living temporarily with neo-monastic communities as teachers, and core members of neo-monastic communities spending time in temporary monastic guest programs such as that offered by Monastery of the Holy Spirit. In regard to learning from monasticism, Michael stresses the need to actually experience monastic life firsthand in order to understand the monastic charism. And while he emphasizes monasticism’s adaptability and flexibility according to culture, circumstance, and religion, he’s also clear on what he considers the constitutive elements of any form of monasticism: prayer, silence, solitude, manual labor, and community. Michael also shares his thoughts on what he anticipates for the future of monasticism (mirroring Ivan Kauffman’s conviction that the future of monastic communities lies in stronger bonds with lay people) and his enthusiasm over the broad interest among lay people today in incorporating a depth of spirituality into their lives through learning monastic values and practices. Embedded in this interview are two questions that have come to the fore for me over the course of this tour of communities. The first question is, simply: what is monasticism? One concern I have is that the New Monasticism movement has been re-defining the very meaning of the word, often with little concrete input from or experience of the classic monastic tradition. While this re-definition process from a fresh perspective expands the monastic imagination, so to speak, sometimes I have difficulty understanding just what’s monastic about particular expressions of the New Monasticism. Hence, I want to carry this question of what constitutes the essentials of monasticism into future interviews with monastics “new” and “old,” and especially into my Monastic Studies program at Saint John’s School of Theology upon my return this fall. Thus far, I’ve received three direct responses to this question: Mary Ewing Stamps, leader of the Methodist-Benedictine Saint Brigid of Kildare Monastery, emphasized the structural elements of stability of place, a leader, and a rule of life (incidentally, even though much of her own formation took place in a Benedictine monastic guest program similar to that offered by Monastery of the Holy Spirit, she prefers the idea of monastics coming to live as teachers with new communities in order to preserve the importance of a sense of place). Camaldolese-Benedictine monk Cyprian Consiglio, speaking from the eremitical (hermit) tradition and from years of involvement in monastic inter-religious dialogue, named the primacy of the interior life and contemplative practice as comprising the core of monasticism. And here, again, speaking from within the Cistercian tradition, Michael identifies the essential elements of monasticism as prayer, silence, solitude, manual labor, and community. How might this gap of experience between the classic Christian monastic tradition and the New Monasticism be bridged? And why? What does each have to offer the other? In this second half of my conversation with Bren Dubay, we speak of the rich tapestry of relations Koinonia Farm now enjoys, with communities already mentioned in the previous episode (Jubilee Partners, Reba Place Fellowship, Church of the Servant King) as well as with the Bruderhof, an early 20th century addition to the Anabaptist communal family tree (which also includes the Mennonites, Amish, Hutterites, among others). Formed in Germany on the cusp of the rise of Nazism, the Bruderhof were expelled from their native country after refusing to allow Nazi teachers to instruct their children. Finding their way first to England, then Paraguay, the Bruderhof finally set roots in the United States with the help of Clarence Jordan and Koinonia Farm in the 1950s. Here, Bren tells the story of how this friendship between the two communities has recently, serendipitously been rekindled, and the intimate bond of mutual help and learning that’s rapidly emerging. Koinonia Farm has also been adopted by the contemporary New Monasticism movement, who consider Koinonia one of its pioneering forerunners. In fact, Bren is part of a network of new monastic communities currently exploring how they might strengthen relations among themselves. She also expresses her strong conviction that this movement’s future lies not only in strengthened bonds with one another, but with the classic monastic tradition. To this end, the core members of Koinonia are currently engaged in a close reading of the Rule of Saint Benedict, with commentary by Joan Chittister, OSB, and plan to continue this practice of shared reading and discussion with other monastic literature. Several members also retreat at nearby Cistercian Monastery of the Holy Spirit in Conyers, GA. In addition to these topics, Bren and I discuss communication and trust in community, and how she looks forward to the collective maturity that comes only with time, longstanding commitment, and patience. What excites me most about Koinonia Farm at this time in their history is this unique confluence of influences: of its own profound spiritual legacy interfacing with that of the Bruderhof, representing the classic Anabaptist tradition (what Ivan Kauffman refers to as the “old” new monasticism), and the younger generation of communitarians involved in the New Monasticism. Koinonia Farm also exhibits the strongest inclination I’ve seen thus far toward seeking ways to learn from and build concrete relationships with the classic monastic tradition. 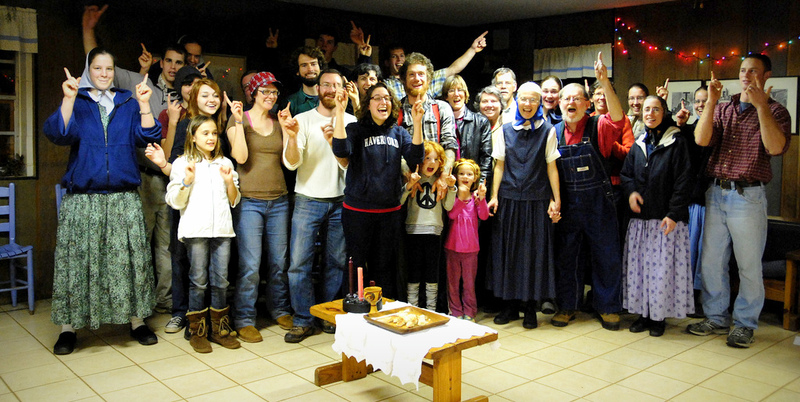 Taken together, these factors render Koinonia Farm a key community to watch as the New Monasticism movement continues to evolve and reach for greater maturity and stability. Other people and resources mentioned in this interview: Jonathan Wilson Hartgrove, School(s) for Conversion. Koinonia Farm in Americus, Georgia, was founded in 1942 by Clarence and Florence Jordan and Martin and Mabel England, with the intention of being a “demonstration plot for the Kingdom of God” and helping the region’s poor, struggling farming families. Foremost among the biblical values they sought to embody were economic sharing among themselves and with their neighbors, racial equality and reconciliation, and compassionate nonviolence. Due to their pacifist stance during World War II and inter-racial composition, the community quickly gained a reputation as an irritant to the surrounding culture. In fact, during much of the 50s and 60s, Koinonia Farm endured all manner of persecution, including cross-burnings, death threats, gunfire, expulsion from local churches, fire-bombing, and a prolonged economic boycott by local businesses. Undaunted by these trials, in the late 60s, Koinonia Farm began the partnership housing movement, building affordable homes for low-income local families. Seeing the global potential of this movement, community members Millard and Linda Fuller went on to expand the endeavor beyond its local scale, giving birth to Koinonia’s most famous contribution, Habitat for Humanity International. 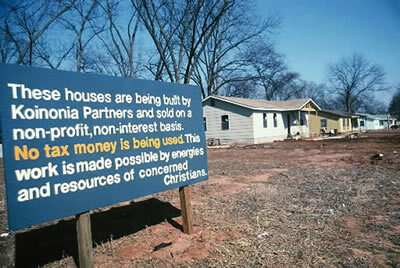 According to Bren Dubay, steward (vowed member) and current Director of Koinonia Farm, while the community enjoyed a certain kind of expansion and growth during the partnership housing era, the very forces underlying that expansion were at the same time subtly eroding the original communal vision. Short-term volunteers swelled the ranks through the late 60s and 70s, motivated more by a particular cause than by the aspiration to embody Christian koinonia, or community, as described in the Acts of the Apostles. As one longtime member succinctly described the scene, “The tail began to wag the dog.” Finally, in 1993, with the decision to reorganize Koinonia according to a more conventional non-profit business model, what remained of the original communal pattern of life was dismantled. Consequently, Koinonia’s focus grew more diffuse, and financial losses were suffered in the process of moving from a common-purse economy to paid employees. 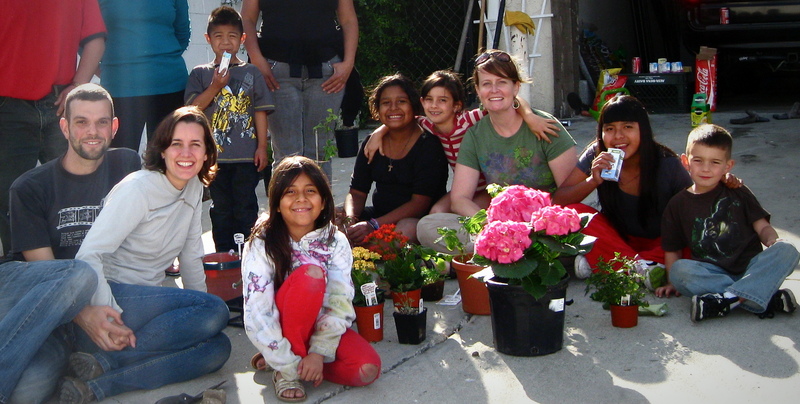 By 2003, it was clear that a fresh vision and new leadership for the community were needed. To this end, the Board of Directors sought to hire a new Executive Director. That’s where Bren enters the story. Prior to her arrival at Koinonia Farm, Bren Dubay had worked and served as a spiritual director, retreat leader, playwright, Montessori educator, fundraiser, and development consultant. In May of 2003, she rather innocently took a group of students on a field trip to Americus, Georgia, to volunteer with Habitat for Humanity. As they were preparing to leave, she reluctantly accepted an invitation to take the students to Koinonia Farm, Habitat’s birthplace. Unbeknownst to her, this visit would trigger a series of events that have since turned her life in a surprising, radically new direction. Within a year, in May of 2004, Bren moved to Koinonia as its new Executive Director. Within another year’s time, she was leading the community in a retrieval of its original communal inspiration. In our conversation, the first of two podcast episodes with Bren, she tells the story of her entering the stream of Koinonia’s rich, diverse history, the decision to return to the original communal vision and how that process has unfolded over the course of 7 years thus far, challenges and mistakes made along the way, and her own sense of inner peace amid the difficulties. We speak of particular changes, such as restructuring the Board of Directors to include one member apiece from 3 other Christian intentional communities; namely, Jubilee Partners in Comer, GA (a community that welcomes refugees from war-torn countries, founded by members of Koinonia in the late 70s), Reba Place Fellowship in Chicago, IL (inspired by Koinonia), and Church of the Servant King in Eugene, OR. Finally, Bren shares her joy in the revitalization of the community’s internship program as an expression of the founders’ intention that Koinonia serve as a “school of discipleship.” Through this program, and through other forms of hospitality, Koinonia Farm welcomes and feeds the spiritual hunger of a wide diversity of people, young and old and in between, of all manner of religious faiths or none at all. What strikes me most in this part of my conversation with Bren is that hers is clearly a vocation story: of an unexpected invitation, of wrestling with the tension between wanting to say “no” yet knowing (without knowing why) to say “yes,” and of an underlying peace and mysterious satisfaction even through difficulties and trials. There’s humility and gratitude in the recognition of having received a graced opportunity to serve; and a posture of faith, even though the way forward may seem anything but clear at times. To my mind, these are the marks of true servant leadership, the branch grafted onto the Vine, and a vital sign of hope for Koinonia Farm’s uncharted future. With 20 podcast episodes published and another on the way, for the next couple of weeks I’m shifting gears a bit, spending more time simply bike-camping. As I shared in a previous post, leaving the West Coast has placed me in a more solitary situation, perfect for deeper reflection and discernment. Also, in this more solitary and reflective place, I sense the two strands of the journey—the spiritual pilgrimage and the exploration of communities—converging in a new way, requiring my giving shape to this convergence through writing. In fact, spiritually speaking, this journey is the sequel to the bicycle tour of over ten years ago that led me back to the Christian faith and into a Catholic monastery. Therefore, to better grasp the content of this present journey, it’s first necessary to recap its prequel. 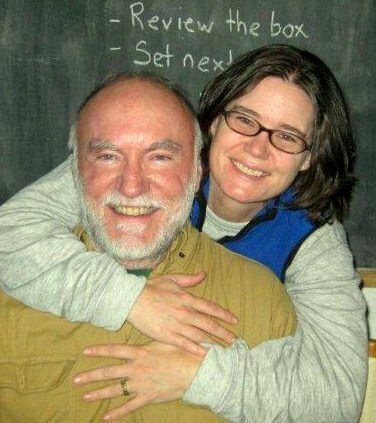 In January of 2001, I left the Sirius Ecovillage in Shutesbury, MA, which had been my home for 2 ½ years. That previous fall, I had been seized by a mysterious restlessness, not simply to move but to create, to generate life, as if, contrary to the earthly season, new sap flowed in my veins and pressed forward to bud and bloom. I sought for ways to express this impulse—start a cottage industry? join the Core Group?—but nothing seemed to resonate. Within a couple months of searching in this way, the insight dawned that this life-impulse was in fact pushing me out of the community. I didn’t know why or to where or for what purpose. I just left. Several months after leaving the community, I was on a bicycle, clothing and camping gear atop the rear rack and stuffed into panniers, bouncing around the deserts of the Southwest and finally tracing the California coast. The pressing life-impulse by that time, at least to my perception, had degenerated into a wrenching sense of futility and an eclipse of life’s possibilities. I simply couldn’t see a road ahead of me beyond the asphalt under my tires. I didn’t know why, but the tide of hope and vision had receded. Did I dare expect its return? Still, the more dependable rhythms of ocean tides and redwood forest cradled me each night as I camped, giving me solace, drawing me out of myself and into the cosmic symphony. I may not have known what to do with the life-impulse entrusted to me, but in more lucid moments I could rest assured that Life beneath and above me, within and beyond me, had meaning beyond telling. Slowly, this sense of communion with Life coalesced into a voice addressing me personally. I can’t remember how or when I took notice, and no, I didn’t literally hear a “voice,” but somehow, at some point, I knew that I should stay in a Catholic monastery if given the opportunity. The press of the life-impulse took on a strange specificity, all the more strange because “I” didn’t share its prerogatives. A Catholic monastery? Why? Yes, I had gleaned inspiration from scant reading of authors such as Thomas Merton and Kathleen Norris, but…did I really want to stay in a Catholic monastery? In the meantime, the miles rolled on underfoot, until one evening in early November, while pedaling down Highway One through Big Sur, CA, I came upon the drive to New Camaldoli Hermitage. Too late to visit, I pedaled on another mile and a half and slept on the beach below. The next morning, having broken camp, I stood on Highway One, looking north, then south, wanting to keep biking but still possessed by the intuition that I needed to visit the monastery. So I did. And I was offered the possibility of a job on the residential maintenance crew. I didn’t stick around to find out whether the position was available or not, though (all the more baffling in hindsight, considering I had less than $300 to my name, with no job prospects ahead), but continued biking, camping on the beach again that night 50 miles down the road. I had no idea where I thought I was going. I just wanted to keep moving. I was searching for I-knew-not-what, all the while dimly picking up on and yet still missing the cues from the One who had already found me and was inviting me to something startlingly concrete. The next morning I woke up depressed. I got ready but just couldn’t bike. I lingered in town awhile, listlessly. I opened the book by Thomas Merton I had bought at the monastery bookstore and began to read. The intuition once again flooded me, reminding me: I need to return to the monastery. I called the maintenance supervisor to see if the job was indeed available and the offer still good. It was. “See me at 9am Monday morning,” he said. That night I camped in the same spot as the last, but this time my spirits were buoyant, filled with a quiet peace and joy. I even danced in the moonlight, beneath a tree, listening to Emmy Lou Harris. The next morning, I turned my bike north to retrace the ride of two days before. Before telling any more of the story, I want to make a few observations. First and foremost, bicycle touring has been for me an act of faith, even when I haven’t been aware of it as such. Yes, I plan and prepare, but I’ve come to believe that these decisions and actions are a participation in a larger pattern and purpose not of my devising. Yes, I planned and prepared for this present tour, and yet I am haunted by the conviction that I’ve also been lured into this endeavor for purposes beyond my own making or comprehension. As the story above illustrates, on the one hand, bicycle touring can have the mark of a restless running-away in a time of distress. On the other, and unbeknownst to me, or perhaps dimly intuited, is a running-toward a wider horizon, a new level of meaning that seems like nothingness until I am led to a crucial breakthrough. The bicycle tour narrated above had a clear, concrete breakthrough-event in my arrival at the monastery. Will this tour have a similar breakthrough? Obviously, I cannot know, but I recognize the telltale symptoms that precede such an event—the sense of being stripped of old ways of perceiving and experiencing meaning, of attachments to particular people, places, goals, activities; in short, being stripped of familiar narratives that held life together for a while but have outworn their appropriateness, a necessary dying in order to receive a new story and direction. Now, having the benefit of being taught by experience, bicycle touring this time around allows me to literally pedal through this process of deconstruction and reconstruction as a conscious act of faith.